This map is best played as Team vs Team (Top vs Bottom). The map has a river that divides two team lands. The only way across is to cross a large land bridge. If the land bridge is secured early in the game. It makes for an interesting scenario. Because both teams will battle for control over the bridge. It kind of reminds me of the 300 Spartans at Thermopylae. A friend of mine says "Every time I play this map, it reminds me of Constantinople and their last fight against the Ottoman Turks." This is a fun map that has had some improvements over the other versions here at HG. This version has more natural resources for better RM games, it has better relic distribution and the bridge is much wider, almost double the width found in version 4. I have kept them as separate downloads because game-play on this map is different. So if you want to try a map that is very different and fun. Try this map, you won't regret it. The theme is pretty ordinary. There is nothing weird, so why spoil the 5? The abundance of shore fish, the mountains etc are all fine without being too much. Fun, michi-style, but impossible to wall up early enough without totally sacrificing eco. AIs often fail to correctly detect the map, so they may attempt to drop a dock. Smarter AIs won't insist too much, but not all AIs are smart. A bit too much food? Flanks usually get tons of food, while pockets are still quite ok with extra hunting. Trushing and wall laming appears viable here. Reduced elevation would help nerfing trushing effectiveness here. It would also help AIs, as well as human players when placing dropsites or TCs. The map is the reason for crashing the game once in 10 or 15 times with AOFE and giant/4v4. Not sure why. Is it the mountains? Tested several times, even online. It never crashed online so far. I have revised the map and will be uploading soon. The new revision has reduced the amount of elevation as you requested. The food and relics are better placed for each player. 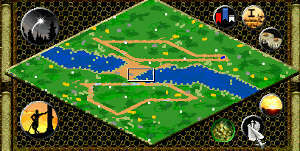 To allow for better RM games I had to reduce the number of mountains, elevations and wood supply on the map. Over a period of three days testing the map online in AOK HD and Voobly I think I have got a better balance.